Hey everyone! Hope you are all having a good start to the last week of April! I can't believe how fast this year is going! It's so scary! Today I thought that I would do my monthly non-beauty favourites for you all as I have quite a lot of favourites this month. I decided that I would split them up once again into beauty and non-beauty so without me rambling too much here's all the non-beauty things I've been loving this month. 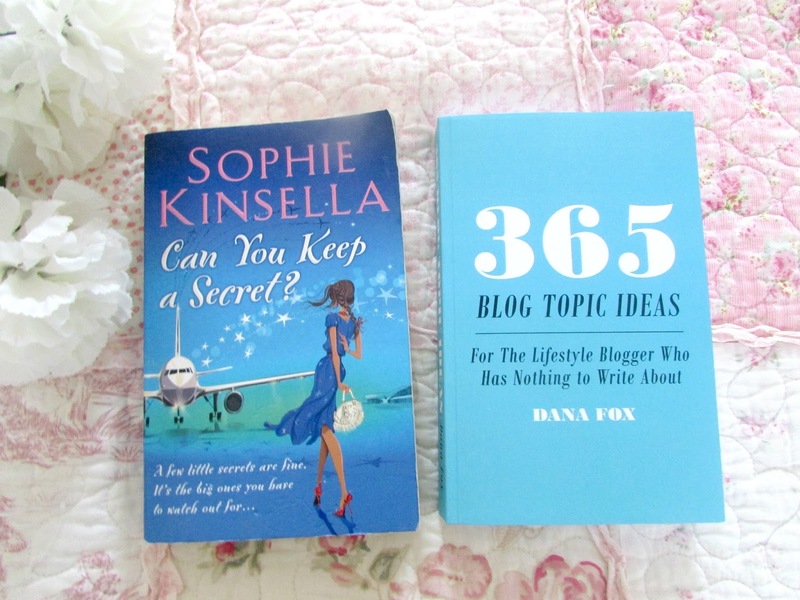 This month I have been reading a lot and one of my favourite books has been one from Sophia Kinsella who I've heard a lot of from other bloggers. This is my first book by her and I absolutely loved it. I think I read in in about 3 days, it was just really good, funny and just an easy read. If you're going on holiday soon and need a good holiday read I'd highly recommend this one. Basically it's about a woman who has a lot of secrets but then she decides to tell someone who she thought was a stranger on a plane. It's really good so definitely check it out. My second book favourite has been a blogging guide by the lovely Dana Fox who blogs over at Wonderforest. I saw this book in a couple of videos and on youtube and I knew it was definitely something I had a purchase. 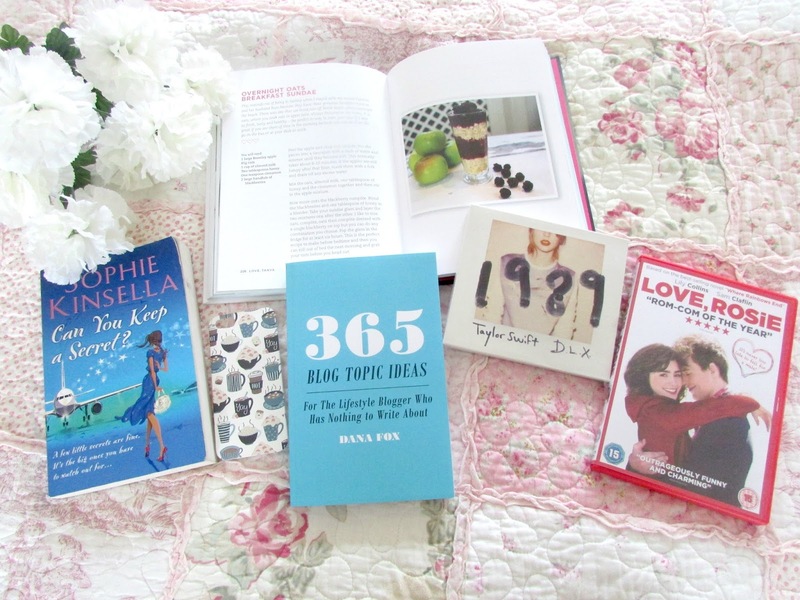 As a blogger I do have those days where I literally do not have a clue what to write about but this book contains 365 ideas, all of which are very inexpensive. There's an idea on every single page and it is just amazing. If you're a blogger and you always get stuck on what to write about this will be an absolutely amazing purchase for you! I've been listening to Taylor Swift's 1989 album a lot this month. I just love all the songs so much on it and 'Welcome To New York' has definitely been my favourite song. I am so excited for her next album already! I really hope she keeps a similar sound to the 1989 album as it's just amazing. My film favourite of the month has been 'Love, Rosie'. This is by the same author who wrote PS I Love You and I absolutely love it. It's such a feel good girly easy to watch film. It will make you laugh and it will make you cry, unless of course you have the emotional range of a teaspoon! It's just brilliant. The book was originally called 'Where Rainbows End' by Cecelia Ahern but she changed it to 'Love, Rosie'. If you haven't seen it yet I'd recommend it so much. Lily Collins is such an amazing actress. Now this phone case is technically last month's favourite as well but because I forgot to include it in my favourites post in March I thought I'd include it in this month's post as I still haven't fallen out of love with it. I'm obsessed with phone cases. I have a drawer in my room full of them as I just absolutely love them. 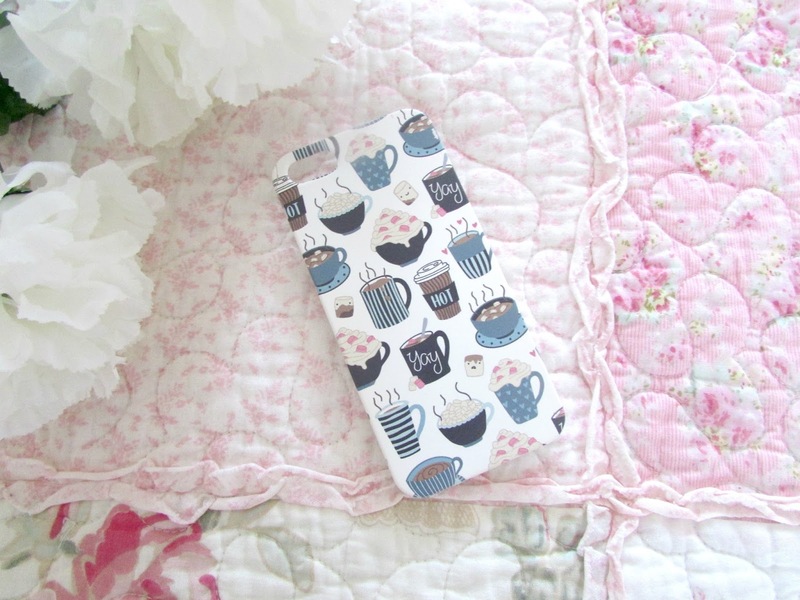 However I saw the lovely Polly from Sighh Designs add a few new designs onto her website and the one that caught my eye immediately was this amazing hot chocolate phone case. If you know me, you know that I'm obsessed with hot chocolate. I just love it so much and I can pretty much drink it any time of the year as it's one of those drinks that calms me down. I just knew that I had to purchase it and it's not really been off my iPhone since. It's such good quality and if you haven't checked out Sighh Designs then click HERE to see more amazing products! I've been experimenting a lot with food this month, especially breakfasts as breakfast was always that one meal of the day I just couldn't eat. I always felt sick at the sight or smell of it and I just never really ate anything until around lunch time which I know isn't good but I just couldn't stomach food in the morning, I was browsing through the lovely Tanya Burr's book and I noticed she had a recipe of overnight oats where you make it the day before and keep it in the fridge so when you wake up the next morning your breakfast is already there for you to eat. I absolutely loved the look of it and it's absolutely delicious. 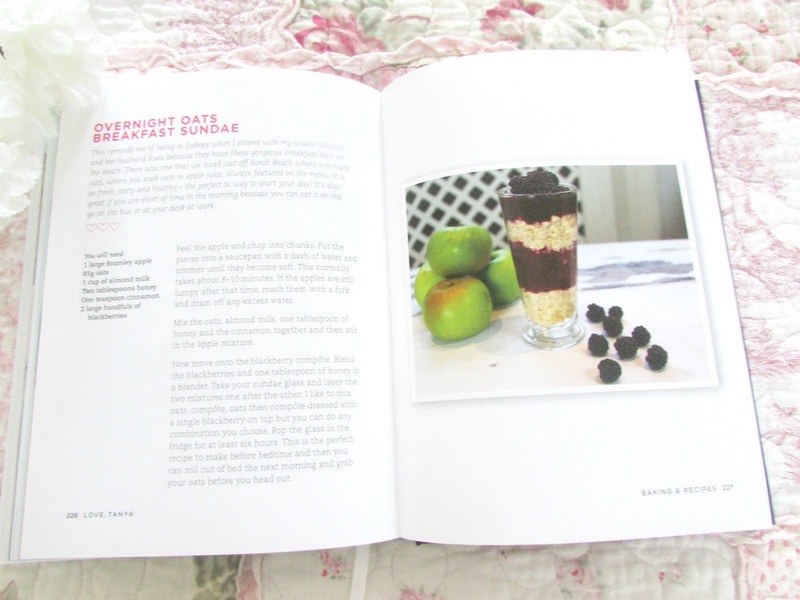 I tried to get a clearer view of the recipe with my camera so those of you who don't have Tanya's book but like the sound of this could just get the recipe however, my camera just wouldn't allow me. I am planning on doing a few recipe posts in the future so make sure you stay tuned for that! 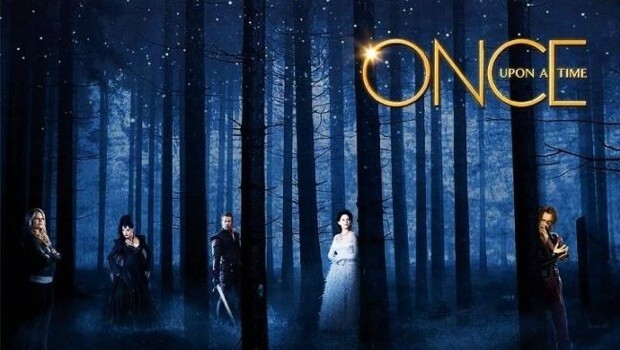 My TV show favourite of the month has definitely been 'Once Upon A Time'. Since catching up on Pretty Little Liars I was desperate for a new TV show to watch and lots of people on twitter kept saying how good it was so I decided to give it a whirl and I am hooked! It's about a bunch of fairy tale characters who have been placed in today's world and it's just really interesting and good and has so many different twists and turns. I find the casting of this show to be absolutely spot on and the story lines for them are super amazing! You won't think of them in the same way after you watch it but I love it! I've just started Season 2 and I'm on the third or fourth episode but I absolutely love it and would highly recommend it especially if like me you're a huge Disney lover! So this is all my non-beauty favourites this month and truth be told this was hard to narrow down. I'm thinking I might start doing videos for my favourites in the near future because I always have a ton of things I want to talk about and I think it would be great to have a little extension of my blog. What do you guys think? Let me know in the comments below if you'd like to see me do videos! For those of you who might not know this I do actually have a few videos up on youtube already which you can check out HERE. Please ignore my awkwardness, shyness, horrific eyebrows (I've since taken care of them) and even more awkwardness and let me know what you think in the comments on the video underneath this post and make sure to subscribe too! What have been your favourite non-beauty things this month? Ahh I've been shamefully hooked on Taylor Swift's album as well. So good! 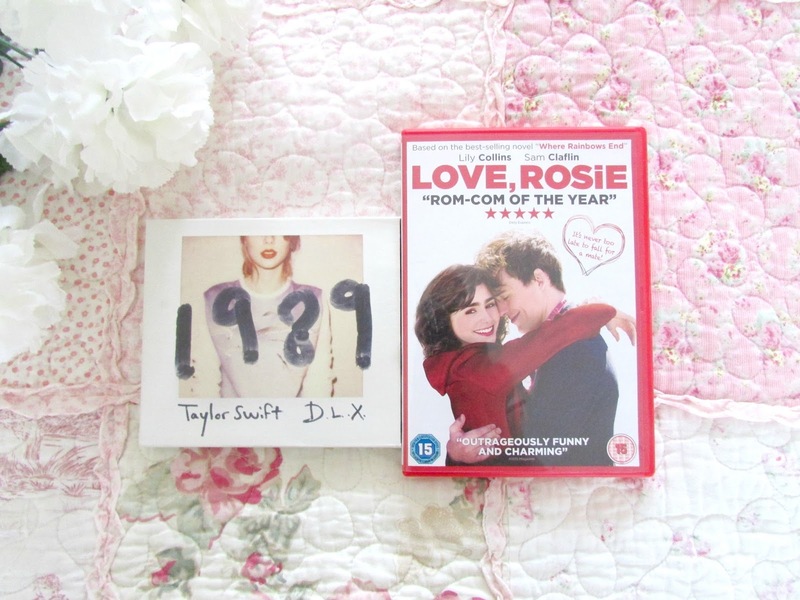 I love Taylor Swift's 1989 album!